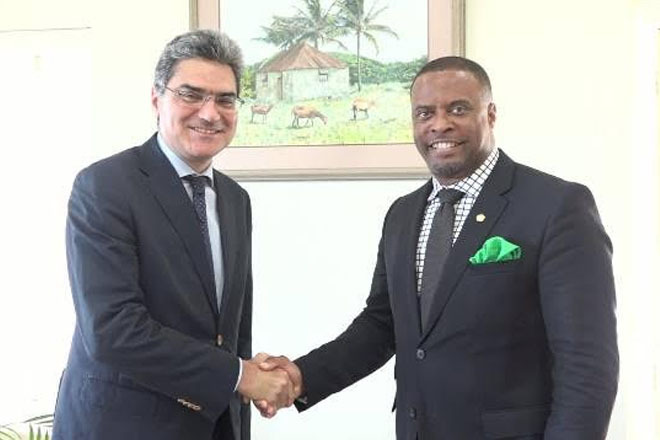 (ZIZ News) — Italy’s special Envoy for Caribbean states, his Excellency Paolo Serpi paid a courtesy call on Minister of Foreign Affairs, Hon. Mark Brantley, at the Nevis Island Administration’s (NIA) office on May 5th. Mr. Brantley said the meeting was centred on deep discussions concerning Italy’s bid to be a member of the United Nation’s Security Council. He explained that there were two available seats in the council but Italy, Sweden and the Netherlands are vying for the positions and each is making its case. Minister Brantley also noted that they discussed other areas of mutual interest including the issue of blacklisting, Small Island Developing States (SIDS) and Climate Change, a matter which impacts both the Caribbean and Italy, which is made up of a number of islands. The Foreign Affairs Minister added that they also looked into areas in which Italy could offer scholarships for training and renewable energy initiatives and best practices, since Italy had done well in the area of renewable energy.